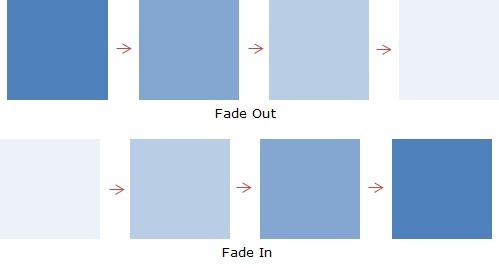 See in this article how to apply fade and slide effects to visual elements of HTML pages using the jQuery library. One of the main resources that the JQuery library has is the easy application of special effects to elements. Two of the most used, and for this reason are the focus of this article, are the effects of fading and sliding. The first one functions altering gradually the opacity of an element until the desired point, generally, until the element is completely visible or invisible. The second one functions "rolling" the element into certain direction, until it gets to the desired point, generally, until it appears or desappers completely. To the examples that shall be presented, we'll use the HTML structure on Listing 1. Where we see the commentary "content of the Listings", we must do what's suggested, the code insertion of the Listings in the specified places. Next, we'll see each effect in detail, with a demonstration a practical example of its use. This effect makes the target element has its opacity increased, until it reaches 100%, when it becomes totally visible. It can be passed as a parameter the duration and one function of call-back, it means, that will be executed at the ending of the effect. The Listing 2 exhibits shows some forms to visualize this effect. The function hide() was called on the loading of the page to hide the div, because the fadeIn effect is used to make it visible. The fadeOut effect does the opposite of the previous function, increasing the transparency of the element until it becomes totally invisible. The structure is quite similar to the fadeIn and the parameters are the same, as shows the Listing 3. This time it wasn't necessary to hide the div, because it was the effect of function fadeOut. It is used to adjust the opacity of an element, passing the new value as second parameter (the first must be the effect's duration). The value of the opacity must be a number betwwen 0 and 1. We'll see now the functions relative to the sliding effect. The function slideUp will "bend" the element upwards, receiving the same parameters of the fadeIn function. 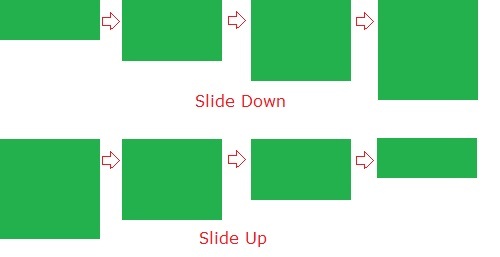 The slideDown is the exactly opposite of the slideUp, as we can suppose, making the object visible after "unbend" it downwards. The parameters and the structure are the same of the slideUp. The slideToggle function, on the other hand, works following the same logic of the fadeToggle, but with the sliding effect. If the elememt is visible, it'll be executed the slideUp, if not, the slideDown. The structure and the parameters are all similar as well. An important aspect, but that was not explict cited, is that the Listings above present many ways to call the same functions, the reader must execute one of each to visualize it's full effect. 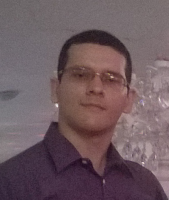 We conclude then that's extremely simple the application of certain effects when it's used the JQuery library. With this, we finish this article. A hug to everyone and see you in the next publication.